I was a little late to the game realizing that yesterday was pancake day, apparently the much tamer, more British version of Mardi Gras, which involves gorging yourself on pancakes for the day. Well, I didn’t go out yesterday. I was working on an article, and I was focused. But I started seeing pancakes everywhere — the BBC, Londonist, other websites I just happened upon, they all had these pictures of perfectly cooked, fruit-filled crepes. I considered trying my hand at making a dutch baby or some other exciting pancake recipe, but I never bought ingredients and it just didn’t happen. Evan made sure to have some pancakes at lunch. Good thing I don’t celebrate Lent — I can still have all the pancakes I want. P.S. Remember that picture? 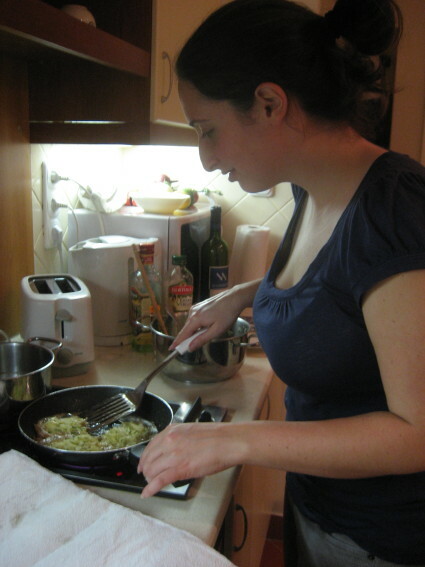 Latkes in Budapest! Potato pancakes count, right? Thursday night, we decided to have a latke party for a few of Evan’s friends from work. 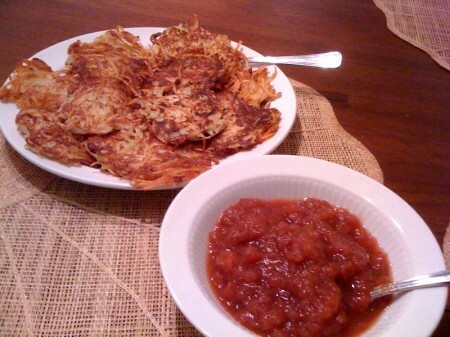 I made latkes with homemade applesauce, a zucchini salad, which was better than I even expected (thanks Martha Stewart! ), and bruschetta. We also had baguettes and cheese and wine. It all turned out well, and I had a fun day in the kitchen, though the apartment still smells like oil 2 days later. Also, we learned that Hungarians don’t use canola or vegetable oil, just sunflower and olive oil. We used olive oil. I usually don’t cook foods that involve that much peeling and grating, but it was worth it. And the applesauce was surprisingly easy to make. Let me know if you want any recipes.